“Recycle Man” To The Rescue! Recycle Man. No, I didn’t just make that up. This guy is amazing. We’ve got a faithful lobster, Scully, up in Spokane. He turned our attention to fine young mascot for the Spokane Indians Minor League baseball team. Without further ado… check him out in all his linedancing glory. Can’t make this stuff up folks. This is just another chapter in the book of “Minor League Baseball Rules.” I’ve said it here, here and here. 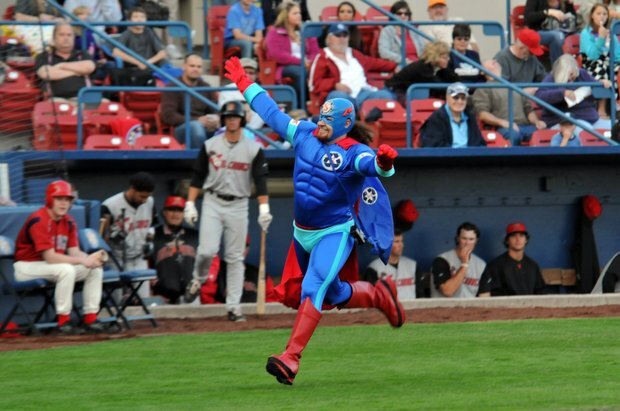 I love Minor League Baseball. Now…I love Recycle Man. It’s kinda long, but totally worth the read… here’s an interview he had with The Spokesman Review on August 18, 2011. Q. How did you get started as a mascot? Q. How did you transition from burgers into sports? Q. Mascot training camp, really? They have those? Q. What do you do at mascot camp? Q. Between Recycle Man and the other mascots you cover some very different characters; how do you get ready for a performance? Q. How do you get ideas for new skits and dances? Q. How much do you interact with the sports team? Q. So, Recycle Man is kind of a nerd? Q. Does Recycle Man get heckled? Q. How do you interact with the audience? Q. Does Mascot Man have a wardrobe staff? Q. Do you have something to keep you cool inside the outfits? Q. At least you don’t have to worry about smiling if your face is covered? Q. So, you get a lot of love? Q. Baseball season is pretty grueling with lots of home games; you must be very high energy? Q. Would you like to go pro as a mascot? You read that right, folks. Trained by none other than the original Phillie Phanatic. You can tell. Dude is just amazing. From what I hear, he gets heckled a ton a games. People chucking plastic bottles at him, or just holding up anything recyclable into the air so he will run up and grab it. Scully tells me he takes it all in good spirits. Impressive. In addition to his mascotting skills, he’s a self proclaimed “You Tube-ologist“. Better trademark that phrase STAT, Recycle Man. I can’t get enough of this cat… “I wore out a pair of brand-new running shoes in 14 games.” Bro, really? I trained and ran a marathon in under 4 hours, and I’m still running in those shoes. I’m “Buzz Lightyear meets Iron Man“. Yeah, you are. My favorite part of the interview? “Q: Do you get a lot of love? A: Yes I do.” And why shouldn’t you, my friend? You are Recycle Man. Cheers to you. Cheers to the planet. Can’t wait to see you in the bigs. 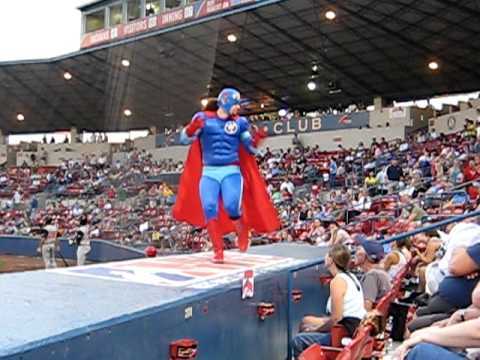 This entry was posted in Baseball, MLB and tagged mascots, Minor league baseball, phillie phanatic, recycle man, recycleman, spokane indians. Bookmark the permalink.